Successfully Added Facial Spray Moisturizer Mist + Power Bank - 10ml Water Tank, 2400mAh Battery, Compact, Lightweight to your Shopping Cart. If you want to look younger for longer forget all the lotions and potions that beauty companies are peddling these days, what you really need is a facial spray moisturizing mist. While plenty of companies are making their own disposable aerosols you can't beat having your very own portable skin hydration system that can be used time and time again. This compact little beauty product slips right into your handbag and can be used throughout the day to tackle tired, dry skin. It works by atomizing water to tiny particles, less than a thousandth of a millimeter across, these can easily work into the pores of your skin to clean treat and brighten your complexion, revitalizing your skin and combating that fatigued look that comes after a long journey or day spent in an air-conditioned office. This facial spray is a true beauty lifesaver that will create an atomized mist of water droplets taking your tired, lackluster dry skin and turning it into a radiant glowing complexion in seconds. If you suffer from oily or acne prone skin this rehydrating facial spray is just the trick as the fine atomized water particles dredge your pores and cleanse the skin helping combat dryness and repair damaged skin. With a powerful 2400mAh battery this compact beauty product also doubles as a power bank so you can recharge your Smartphone, music player or other gadget when on the go. It's the perfect travel and beauty accessory that will keep you looking stunning this summer, so you shouldn't leave home without one. 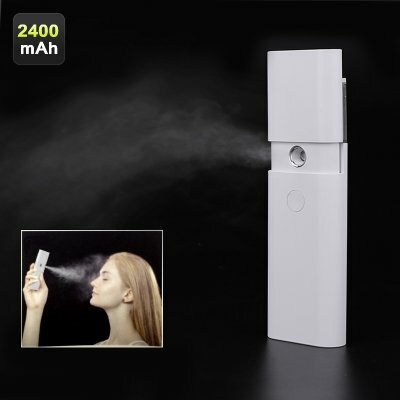 This facial spray moisturizer mist + power bank comes with a 12 months warranty, brought to you by the leader in electronic devices as well as wholesale beauty gadgets.. Brilliant. After a chemical at work has left me with eyes that clog up with muck, I can have a short spray and clean up a bit, and the nano-spray means I can keep my eyes open for a good clean. I am very happy with this spray. No instructions, you have to work it out for yourself.